Have you ever wondered how a book originates from the heart of the author before it ever reaches the hands of the reader? 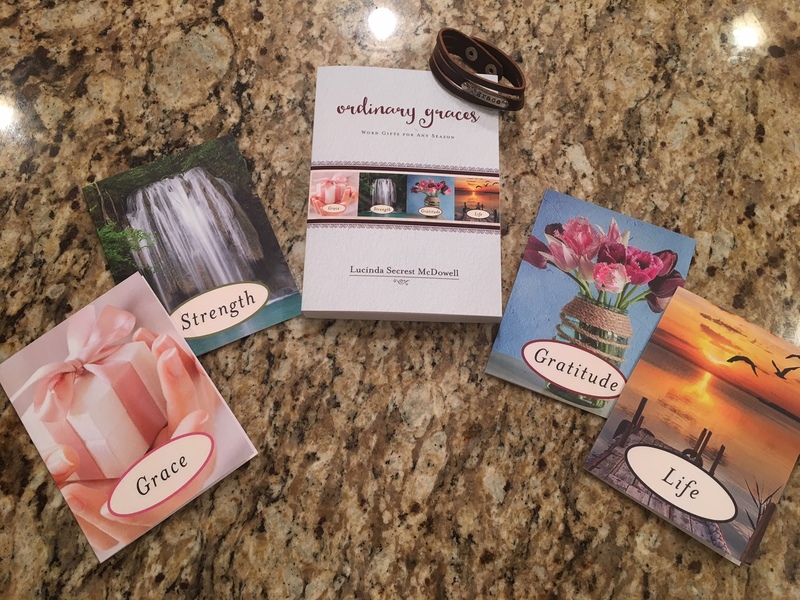 It’s a grace to welcome multi-published author Lucinda Secrest McDowell to my online home today to tell you a bit about the birth of her newest book Ordinary Graces, new this month from Abingdon Press. If you’d like to win a copy of this wonderful devotional resource, please leave a comment below. Cindy, tell us about your new book. What does the phrase “ordinary graces” mean? How did you go about putting together this book? Once I knew that I wanted to write about grace — which is from the Greek word charis, for gift — I began to think of major categories of the many blessings we receive. The places we most need a touch from God. Somehow, in the process of prayer and my own Bible study, these four seasons emerged: Grace, Strength, Gratitude and Life. When it was time to write the dedication, I decided to speak directly to my reader: “I dedicate these words to You… For the striving, here is Grace. For the weary, here is Strength. For the anxious, here is Gratitude. For the broken, here is Life.” Then it became a matter of choosing Scripture that fleshed out these many gifts. My passion as a writer and a speaker is to touch the place where people are seeking or hurting and bring them back to God’s clear Words of truth and encouragement. Tell us about the epigraphs at the beginning of each section. Once again, as I did with “Dwelling Places,” I am delighted to include portions of the poetry of Amy Carmichael as epigraphs which introduce each section of the book “Ordinary Graces.” Amy Carmichael was an Irish woman who chose to spend her entire life in India, rescuing young boys and girls from temple prostitution. She was a courageous person who pioneered a ministry in human trafficking back in the Victorian era when such things were simply not even discussed. In the middle of her life, she experienced an accident which left her in permanent chronic pain. Her lyrical poetry is at the same time deep and simple. It speaks to the heart with great devotion. This is my way of sharing one of my own spiritual heroes with a whole new generation of readers. Of course, many of my readers already know Amy, and are also thrilled to see her words still quite relevant in a twenty-first century book. What do you think people mean when they call your books non-typical devotions? I have no idea! I personally enjoy a variety of devotions – spiritual readings that draw us into the presence of God, helping us grow in our faith. When I started writing such books, I realized that I wanted to write what I personally wanted to read. In other words, I wanted my devotions to be a balanced combination of inspiration and teaching, always with practical application! And yet, the nature of a daily reading is that it is short, not exhaustive. So that was then the challenge of writing short, yet deep. Not easy! In the process of telling stories, I wanted to offer substance that enlarged the reader or made them want to dig in more to God’s Word. And then do something about it. These devotions are best when they are a mere catalyst to further study. Also, I include many other fascinating sources in “Ordinary Graces” – not just my own limited wisdom. Are there words that are especially important to you in this book? I love all 120 words, but I must admit that the word grace has totally changed my life! So on the very first day of “Ordinary Graces” I explain how I went from a needy, insecure, self-centered person trying to earn God’s love to the one whose primary identity is as beloved, limping and faltering along my journey – grateful for every opportunity to share that God’s grace and mercy are gifts, not rewards. Thus, words in this book like belong, striving, comparing, merciful, enslaved, peer pleasing, least, broken, weakness, groaning, weary, story, real, unfailing love, approved, baggage, and difficult times (sorry, that’s a lot of them) are especially dear to me, because I have learned them the hard way. Truth be told, each word in this book came with a price. I had to first live it before I could share it with you. I’m still on the path – I certainly won’t have mastered them completely until the other side of glory. But I’m not where I was before. And my deepest prayer for my readers is that when they finish this book, they can say the same thing. A meaningful verse to me is James 1:17. Maggie, again your blog was filled with “graceful” thoughts for me. I simply stumbled on your blog today, Maggie. But this was a great post. I’m looking forward to seeing more of your posts in the future. Blessings! I have been very blessed in the past by Cindy’s writings and I look forward to this one.